I am always looking for good resume advice, but I find that a lot of websites say the same old thing – customize your resume, proof read it, etc. The last time I posted about resumes was here when I talked about Lindsey Pollak’s new book From College to Career. That post laid out the basics of creating the perfect resume – keep it to one page, proof read it, keep it traditional, etc. While all of that is important, the piece about using the right buzzwords is probably the one thing that will make your resume stand out from someone else’s resume. So, how do we go about making sure that we say the right thing and get the hiring manager’s attention? I was recently forwarded some great advice by my friend Miss K over at River City Fashion. I really enjoy her blog and would suggest checking it out and writing her if you ever have fashion advice. She spends a lot of her time talking about what is acceptable to wear in a professional environment. Ok, that’s it for my shout out to Miss K.
So, back to the advice – what to do to ensure that you have the right buzzwords. According to New York Times Bestselling author Martin Yate, the answer lies in Target Job Deconstruction or TJD. What on earth is TJD? 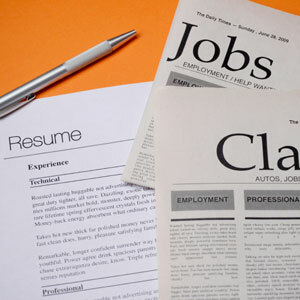 First, collect 6 job postings for the job you are best qualified to perform and save them or print them out. Yates suggests using job descriptions for the area you are looking to work in, i.e. Atlanta for me. I think this is important so that you know what people are looking for in your area from someone in your field. Second, open a new Word document and copy and paste (or type) out the various job descriptions that you found. According to Yates this will allow you to see what an employer hiring someone in your field is looking for and what words they use to describe that person. After you have these job descriptions typed out you are to come up with the appropriate job title, which is to appear on your resume after your name, i.e. Mrs. K, Attorney in my case. I know this may be foreign to you (and I have to admit I have never done this before), but according to Yates this will make your resume more searchable on databases and by hiring managers. Third, look through all of the job postings and find the skills/responsibilities/experience/deliverables that each job posting has in common and type that on your Word document. Then go through all of the job posts and list the skills, etc. that any of them have in common with another one. What’s the purpose? This will allow you to see what kinds of skills the employers hiring in your field are looking for and you will be able to use them in your resume. Fourth, think of examples that you can write down that correlate to the skills that the employers are looking for. For example, if the employers hiring an attorney are looking for someone with trial experience, capitalize on the trial you recently won and the work you put into it. Fifth, look at the job requirements you have identified and think of the best person you have ever seen perform those skills. Once you figure out who that person is, try to pinpoint what exactly made you think that that particular person was so great at that skill. Then think of the worst person you know that has performed that skill and identify why you think that person was so bad. What’s the point? Yost says that this will allow you to see the behavior profile of the person that the employer wants to hire. Lastly, put all of this together. Now, Yost doesn’t really explain how to do this – but here is some of my advice. Use the job descriptions you found earlier and make sure that you can match a skill and an experience with each description. For example, if the job requires you to attend court hearings, discuss (in the experience section of your resume) how you have appeared in court and won hearings on your own. Think about that person that was the best at a particular skill and try to bring their qualities into your resume. For example, if you are trying to get hired as an attorney and the best trial lawyer you know is X, and X is so great because she has a great presence in the courtroom and is the hardest worker you know, then try to use examples of work experience that make you look like X in the eyes of the employer. You could say something like: Prepared diligently for my first trial on a breach of contract claim and received the highest judgment in the State of Georgia for my client. NOTE: While you can use these job responsibilities and required skills as a road map for your own resume, remember that you shouldn’t EVER by lying about your experience. What do you guys think? Did you find Yate’s advice helpful? I am a huge fan of Lindsey Pollak. For those of you who don’t know her, she is a career expert, the global spokesperson for LinkedIn, and author of Getting From College To Career: 90 Things To Do Before You Join The Real World. Pollak’s book has some great advice for those of you looking for a job, but today I want to talk about her resume tips that she recently posted on her blog. We all know that having the perfect resume is part of landing your dream job. I have read a lot of material on what exactly needs to be in your resume, what you cannot have in your resume, and how to make your resume sound better, but I tend to really like Pollak’s tips. Here are some of my favorites. Pollak says that you cannot reinvent the wheel. I wholeheartedly agree, unless of course you are going into a marketing or social media type of career where the infogramic resume is appropriate. (What is an infogramic resume? See my blog post about it). When you are first starting out in your career, Pollak says that it is best to keep your resume traditional. Her first book (second edition is coming soon) has a lot of great resume examples for entry-level positions. Yes, I know how annoying it can be to create a new resume for each individual opportunity, but if you really want the job that is what you need to do. From what I read online and in career advice books, employers know when you are sending them a generic resume that is also being sent to tons of other employers. Pollak says that it is fine to have one generic resume, but you need to add certain accomplishment and emphasize certain experience depending upon the position that you are applying for. When I was looking for a job I took the time to do this. I had a resume for government jobs, a resume for corporate jobs, and a resume for law firm jobs. When I would apply to one of those types of jobs I would take the generic resume and make it better, emphasizing certain experience or accomplishments based upon what I could tell the employer was looking for. Pollak urges job seekers to prioritize the bullet points under each previous job they have held (and yes, you should ALWAYS have bullet points). When I applied for jobs I always assumed that I needed to put the most recent task under the first bullet point, but Pollak suggests that you put the most impressive accomplishment at the top. I think this is a really good idea just in case the employer doesn’t actually take the time to read all of the bullet points. Don’t Include Something You Hated Doing. I LOVE this advice. When we are all first starting out we feel the need to include every single job we have ever done on our resume. Pollak, however, suggests that if you ever had a job that you hated and never want to do again, then don’t advertise it on your resume. Pollak says that you can even leave entire jobs off of your resume if they are completely irrelevant to the job you are applying for. So, if you had that job at McDonald’s last summer and you are applying for a marketing job, maybe you should leave that experience off the list. If you are still in college or graduate school and you have career counselor resources, use them. If you are not still in school, but can afford to have a professional take a look at your resume, then let them. It can’t possibly hurt to have someone tell you what your strengths and weaknesses are in your resume. Having two pairs of eyes is always better than one. Check, Check, and Check Again for Typos and Inconsistencies. I went to a career fair once while I was still in law school and handed my resume to a woman at a table. We talked for a few minutes and then I moved on. About two days after the career fair I got an email from the lady pointing out certain inconsistencies in my resume. She noted that under one job my bullet points were round and under another job my bullet points were square. She also pointed out that some job titles were italicized and some were not. While these were VERY minor inconsistencies, it obviously caught her attention and irritated her enough to email me. I have now learned that it is very important to triple check your resume to make sure that there are not any inconsistencies or typos. No one hates typos more than an employer looking at your resume. While I understand that Pollak suggests that all resumes should be kept to one page, I have a two page resume. Yes, I know, I don’t have years and years of experience, but I have a lot of education, honors, and certifications that need to be listed. I would suggest to look at people’s resumes in the field you are going into and see whether they are limited to one page or not. If they are, I would try to limit it. 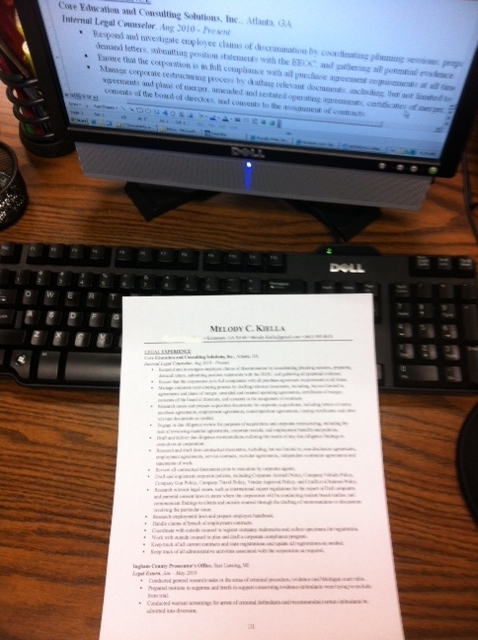 Pollak says that a one page resume shows the employer that you can censor yourself and present yourself concisely. What do you think of Pollak’s tips? Is there anything she is missing? Have you ever been told great resume advice by someone before? Are Infogramic Resumes a Thing of the Future? 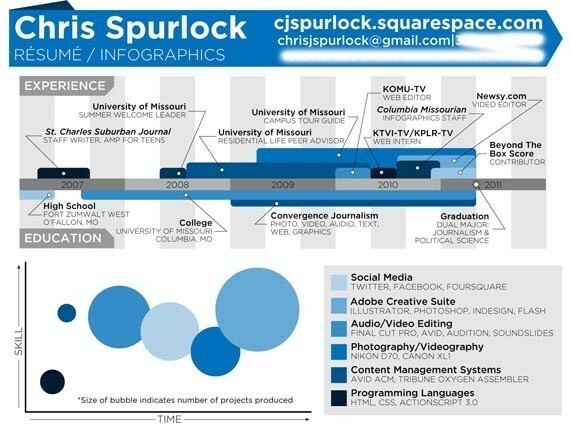 I have been hearing a lot about the new infogramic resume trend. At first I was completely turned off by it and thought that no professional in their right mind would use such a thing. However, the more that I think about the infogramic resume the more I am persuaded by the ability of the graphics within these documents to help a job applicant catch a company’s attention. So, you may be asking what on earth is an infogramic resume? I asked that very same question. An infogramic resume essentially portrays a job applicant’s experience, interests, and other important information by way of digital graphics. No more boring black-and-white resumes on stiff resume paper. No more bullet points and correct grammar. Graphics, apparently, are the newest and best way for a job applicant to stand out amongst the other applicants and catch an employers attention. The problem with infogramic resumes is that not everyone has the skill required to make the graphics look professional. Thankfully because we live in a digital age, those not-so-talented folks have access to the internet and the sites that are making it easier to create these documents. Now, just so you know, I did not create that document. 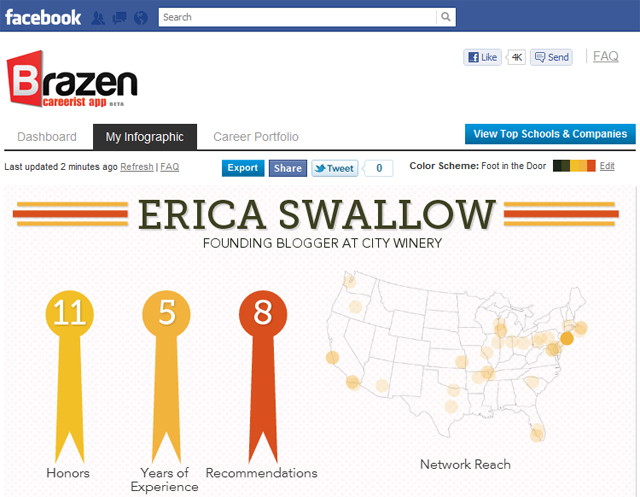 I found it on the Visualize.Me blog, which has a lot of helpful job tips on it. While these are great tools to give you the infogramic resume look, the best infogramic resume I have seen came from Craig Kanalley from The Huffington Post. In an article published on The Huffington Post, which I just LOVE to read, Kannalley gave some advice on how to follow in his footsteps. I think the best advice he gave was when he said to think about where you are applying before you spend the time creating a document like this. While I do love this new idea and the visualization of it, I do know that submitting such a resume in my field (legal) would get you absolutely no where. However, if you were applying for a graphic design position, marketing position, or for another position in a field that is not stuck in the 19th Century, then the infogramic resume could be a good way to go. What do you think about this new trend? Would you submit such a resume if you were applying for a job?